As further proof that fashion – and men’s fashion in particular – operates entirely in cycles, I don’t think I’ve ever seen as many popover-style shirts at so many different retailers as I have this spring. Although it never disappeared, the popover hasn’t exactly been a mainstay of menswear since the 60’s, when Gant made up the style in oxford cloth and it became an instant favorite of the Ivy set. Certainly, there have always been men who’ve worn them, especially in Italy (as opposed to elsewhere in Europe) – Gianni Agnelli was, after all, well known for favoring them – but especially in America, they’ve been a purely casual item to be found mostly at Ivy retailers (Brooks Brothers, Gant, occasionally J. Press), and mostly made up in Ivy colors and fabrics. The thing is, the popover wasn’t a new style when Gant “introduced” it to the East Coast (besides, Agnelli appears to have been wearing them – with a spread collar as opposed to a button-down collar – by that point). It’s full-length buttoning that’s relatively new, and which only appeared in the mid-1800’s. If you’ve ever browsed antique shirts, you’ve probably noticed that most of them – whether they’re the sought-after French workshirts or the “formal” English pieces – only sport half-plackets. It was only after the introduction of the full placket that popovers slowly disappeared across most of Europe and America. Part of the recent dearth of popovers, at least in terms of contemporary fashion, must surely be due to our decade-long obsession with Tight Things. Since popovers must be pulled on over the head, they require a bit of extra room in the body to accommodate waving arms and wide shoulders, and I can only imagine that said extra room was anathema to most brands attempting to ride the slim fit wave. In addition, the view of popovers as a purely casual item didn’t do much for their popularity, but as tailored clothing continues to become less and less important to the daily lives of most men, it appears that popovers are – at least in some places – back on the menu, so let’s talk about how to wear them. First, it’s easy to find casual popovers cut to a length that’s meant to be worn untucked. 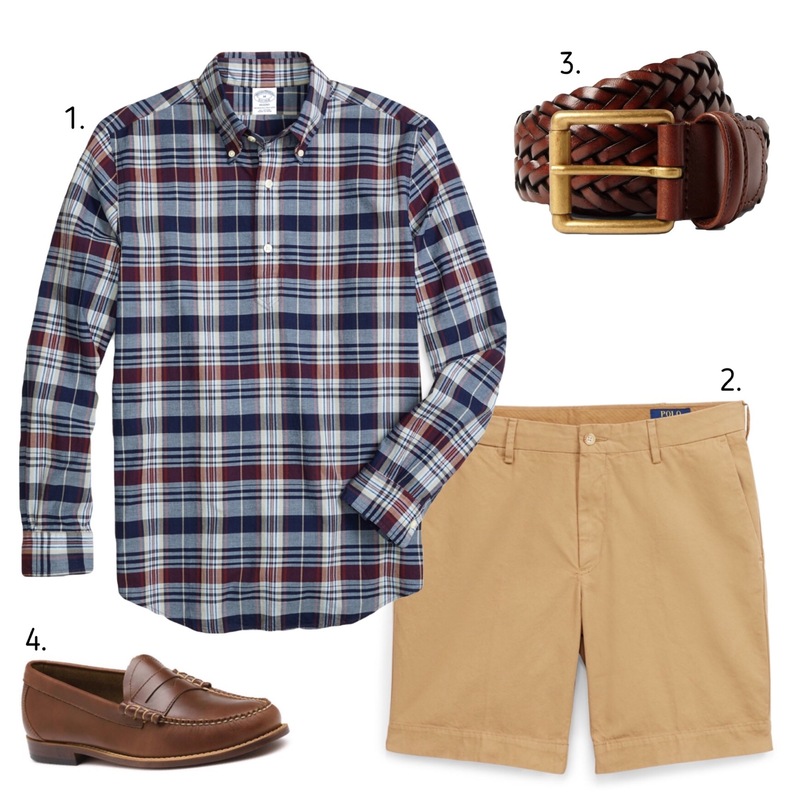 If you want to channel Ivy style, add a pair of chino shorts, a woven belt, and some penny loafers, and you’re set for summer on the Vineyard. Spring and summer are, in my opinion, the perfect seasons for popover-wearing. The slightly relaxed cut, especially when done in a linen or linen blend, is great for warm weather, especially as a vacation shirt. That’s because it’s nice-looking enough that you can wear it out to dinner, but not so nice that you feel bad bundling it up with a beach towel. And you don’t have to be channeling the preppy thing, if you don’t want to. Roll up the sleeves, put on a pair of Vans, and you’ll look just great. Or do as men such as Gianni Agnelli and Yasuto Kamoshita do (Kamoshita also often wears polo shirts under his jackets), and wear yours under an odd jacket or with a suit. The point is that no matter the style you’re after, a popover is a great shirt to have in your wardrobe. If you’re looking for casual options, affiliate Need Supply is a good place to start, as are brands like Gitman Vintage. If you’re open to wearing a band-collar shirt, those aren’t hard to find at all. Tailoring-friendly options are a bit less easy to come across, although Kamakura offers their own take on the Ivy classic, as does Brooks Brothers. Eidos has been known to offer both band-collar popovers and long-sleeve henleys in the past, and Ralph Lauren’s stock rotates regularly. Amusingly, Gant’s own popovers come and go as well, so you may have to do a bit of searching. If you know exactly what you’re after, Proper Cloth also offers popover plackets as an option. It just so happens that affiliate No Man Walks Alone stocks this great linen popover from G. Inglese, which would look pretty darn good with one of those Solaro suits we keep talking about. Wear it with a tie or without, with laced shoes or loafers. However you decide to wear it, wear it in good health, and enjoy the good weather. Summer, to any menswear aficionado, means Solaro. How could anyone not love a fabric that contains the essence of summer in its name? Because of the neutral tone of the cloth, a Solaro suit is quite easy to wear, and you probably already have in your closet the right garments to complement it. Let’s explore a few options that will make the most out of your sophisticated Solaro suit. Because of the summer nature of the Solaro fabric, chances are you’ll want to wear a light shirt that will keep you cool. I would opt for an ivory/white shirt in linen or light cotton, with no pattern. Light blue works just as well, but be mindful not to add too many colors: the beauty of the Solaro lies in its red iridescence, and you shouldn’t wear any color that overshadows it. Since Solaro suit pants look good even when separated from their jacket, your outfit will look put together even in case the heat will force you to remove the top part of the suit. You can even unbutton the first two buttons of the shirt, roll up the sleeves and prepare to look as close to Gianni Agnelli as you’ll ever be. I grew up in a country where men hardly wear suits with matching pants and jacket. Okay, this is an exaggeration, but I assure you that it’s not uncommon for Italians to play with their suits and mix & match their parts according to their mood and taste. Because of the light tint of the fabric, a solaro suit will give you plenty of options should you decide to wear the pants and jacket separately. White is, again, an excellent pairing, as well as warm tones that flatter the red hue bleeding from the weave. If you’re feeling brave, you can even wear a pair of blue jeans, like style icon Lino Ieluzzi. Spezzato with Solaro jacket, linen pants, and unlined loafers. Spezzato with Solaro pants, burgundy linen jacket, and light blue cotton shirt. A burgundy tie and an earth-toned pocket square will complement both the red and tan hues of the cloth, like the ever-impeccable Fabio Attanasio shows in the picture below. Naturally, since the Solaro is a light color fabric, you can go tie-less – as most people seem to prefer. @fabioattanasio in a Solaro suit and straw hat. @linoieluzziofficial wearing a Solaro jacket with jeans. @mostexerent wearing Solaro pants and an unbuttoned shirt. Usually solaro suits are made bespoke, but you can find ready-to-wear options such as this suit by Eidos for No Man Walks Alone. You can also get a made-to-measure, made in Italy Solaro suit by Lanieri. Let us know if you’re the proud owner of a solaro suit or if you are considering stepping up your summer game and buying one in the near future. Don’t forget to share your pictures in the What Are You Wearing Today? thread on Styleforum! If you would like to read more about Solaro, click here to learn about its history and why it makes a perfect choice for a summer suit. For more inspiration about Italian style, check out the 5 Rules To Dress Like an Italian. The time has come to legitimize the Solaro suit as a staple garment in any man’s wardrobe. Oh please, don’t give me that look. We already established a long time ago that brown and earthy colors are no longer reserved for the countryside, and we integrated them as part of our daily – and even business – clothing. A Solaro suit is going to be your best investment this summer. First, let’s go back to the origins of the fabric. Despite being quite popular among the Italians, we owe the invention of Solaro to the Brits and their assumption that the red color repelled radiation caused from direct sunlight. The Solaro was born at the dawn of the 20th century, during the colonialism of the Tropics. The London School of Tropical Medicine dedicated studies to the wellbeing of the soldiers in colonial lands: climate conditions in tropical areas were incredibly harsh, and a need for new fabrics and garments to protect the colonizers arose as it did the belief that they were responsible for dreadful tropical diseases. One of the School’s scientists, Louis Westenra Sambon, conducted some studies on the skin of the colonized populations, coming to the conclusion that the darker pigment was able to block off the UV rays coming from the sunlight. It was clear to him that Nature provided the natives with the necessary protection against the harm of the climate, and that the colonizers would have had to find a way to protect their fair skin just as well. Clothes were the obvious choice, as they act as an additional layer to protect the body from the external agents. It was common knowledge at the time that light fabrics retained less heat than dark fabrics; however, white garments were not quite suitable for soldiers. Khaki green, on the other hand, was both light and suitable for a soldier’s uniform, and that’s why Dr. Sambon chose it as the base of the cloth of his invention: the Solaro. He added to it a red layer that supposedly repelled the UV rays. His assumption is at the base of Dr. Sambon’s choice of wool for the Solaro. this characteristic produces an iridescent sheen that is most evident when the light hits the fabric at a specific angle, but it is nonetheless quite subtle. Today there are several mills – Loro Piana, Drago, Angelico, to name a few- that produce Solaro in a variety of weights and hues, yet remaining somewhat faithful to the mid-weight, khaki-and-red original version. The most common fabrics employed to create Solaro are pure wool twill and yarn-dyed gabardine. As I mentioned, the Italians are particularly fond of Solaro suits, as they embody perfectly the Italian sprezzatura with the relaxed, casual, and slightly impudent look provided by the semi-iridescent cloth. It’s not uncommon to spot distinguished, elderly Italians wearing Solaro suits, whether they are businessmen riding a bicycle in Milan, or classy Neapolitan gentlemen savoring espresso at a café while reading the Corriere della Sera. – It’s a conversation starter; we are not given that many chances to make fun of the Brits (if we don’t consider Brexit) so why lose the chance to make a joke of their belief that a red thread in their suits would keep them safe from tropical diseases? Jokes aside, the history of the fabric and its continental charm make a good topic of conversation for anyone who has an interest in menswear or history. – It’s unconventional but not crazy extravagant; the red sheen is barely there, just enough to remind the world that you are confident enough to pull off a suit that goes beyond the conventions. You own it. – It suits everyone. Just take look at the gallery, and you’ll see that a solaro suit looks good on every single person, flattering every complexion from the fairer to the deeper. Additionally, it seems to class-up everyone’s style, making the solaro suit the male equivalent of a pearl choker. – It makes a great option for business casual. I promise not to roll my eyes and scoff when you tell me that America is too conservative to allow such a suit to be part of a business environment. However, to the West Coast fellows that suffer from suit envy because their workplace is too casual to wear even the most innocent two-piece navy suit, I say: this is your chance! A Solaro suit is casual enough to be worn even in an office where the most formal piece of clothing is not-ripped denim, and you won’t be labeled as “the uptight dude in the navy suit”. Plus, you can lose the jacket any time and not look like you forgot a piece of your outfit at home. If you’d like to read what other forumites have to say on the matter, there is a whole thread dedicated to wearing Solaro for business. – It’s incredibly easy to style. Click here to read our guide to wearing a Solaro suit – including some spezzato options! Note: please note that the original Solaro cloth is only available through Harrisons and their agents, and it is a registered trademark. Any other maker that refers to this type of cloth with the name Solaro is in trademark infringement. 3. Jaeger Gustav. In: Dr. Jaeger’s Essays on Health-Culture. Tomalin Lewis RS., translator. London: Waterlow and Sons; 1887. p. 116.